One of our favorite places we visited in Florida earlier this month is Blue Spring State Park. It's only a few minutes from our hotel in DeBary, FL. As a state park, you'll pay a fee to enter for the day. We paid $6 for our car. In the winter, more than 200 manatees come to stay. The park has over 2400 acres, and includes a north-flowing river, a lagoon, a 1/3 mile boardwalk, and much more! Stop by the visitors center to watch a shore interpretive video about the manatees that come to Blue Spring each winter. In the summertime, you can swim, tube, snorkel or dive in the 72 degree waters of the spring. There is a lawn area for sunbathing, picnic and BBQ areas are close by too. There are also 3 covered pavilions that you can rent for reunions or get-togethers. There are also cabins and 51 campsites. Want to really get away from it all? There is even a 4.5 mile hiking trail that takes you to a primitive campsite near the St Johns River! If swimming isn't your thing, you can rent a canoe or kayak, take a kayak tour or a 2 hour river cruise. The water is clear and beautiful in the spring. There is gift shop offering food and beverages near the Spring as well. We saw some wild hog babies (seen in bottom left pic in my collage above) near the restrooms the day we visited, and also had time to talk with one of the rangers about the park. He told us that manatees had been spotted in the spring the day we visited! David wanted to get in, but the water was still a little too cool for him! (It was a chilly day) The park is absolutely beautiful and very well-maintained. It would be a great place for a picnic on a hot summer day, followed by a dip in the spring! 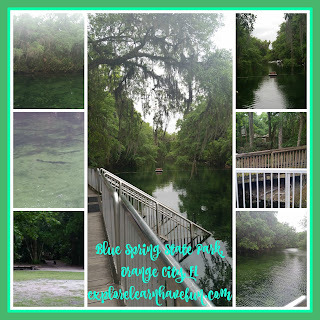 A little more about Blue Spring ~ it's a first magnitude spring that sends 104 million gallons of water daily into the St Johns River. In 1971, an episode of the Underwater World of Jacques Cousteau was filmed at Blue Spring, called "The Forgotten Mermaids" - the manatees of Blue Spring. It is a habitat for at least 15 threatened or endangered plants and animals. Among the creatures you may see at Blue Spring State Park are the Florida Scrub Jay, black bear, gopher tortoise, herons, gar, sunfish, swimming turtles, and alligators! We saw lots of gar in the spring - I thought they were logs until they started moving! Those fish are BIG! Click on my collage above and you can see them in the middle picture on the left side. We enjoyed visiting the Park and the spring, and next time we are there I hope to finally see a manatee! Hours are 8 am until sunset, 365 days a year! You can read more online at www.FloridaStateParks.org and the West Volusia Tourism Bureau's website. Next up: Green Springs Park & DeLeon Springs Park - check back soon!